An important piece of the Padorama puzzle? 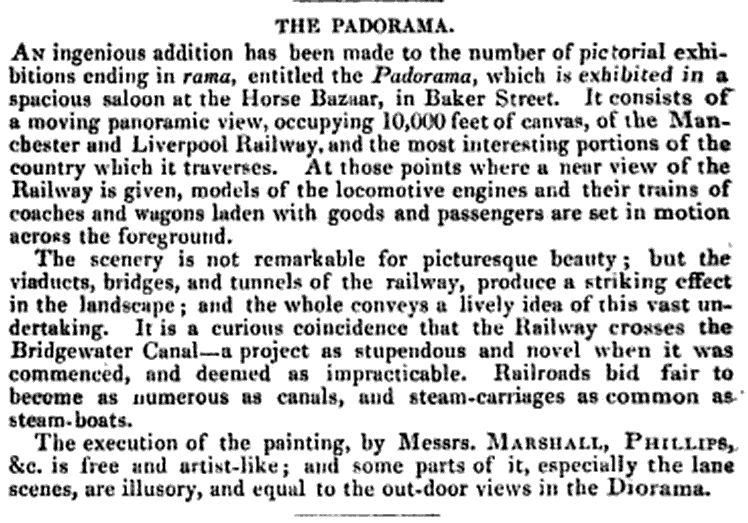 The booklet accompanying the Padorama exhibition is a valuable source of images of the early days of the Liverpool & Manchester Railway which opened in 1830. Both the booklet and exhibition covered the 31 mile journey from Manchester to Liverpool. The exhibition was held at the Baker Street Bazaar in London and appears to have been open from mid-May until the end of August, 1834. Its presence would have coincided with construction of London's first steam railway, the London & Greenwich, which opened in 1836. Although there has been much speculation, little is known about the origins and nature of the Padorama. A brief description in the Spectator, however, gives valuable context. Figure: Excerpt from the Spectator, May 1834. It was a moving panorama rather than a model railway set against a static backdrop. It is not possible to say whether this involved the canvas being located on the outside of a large rotating cylinder or being scrolled between two spindles. While the latter was normally the case during presentations, i.e. with a speaker interpreting the scene, the Padorama operated on a continuous basis such that the entire display could be seen in 30 minutes from time of entry (as per the final advert in the same volume). As house lights would probably be dimmed, the accompanying (and optional) booklet would be of limited use and was probably more by way of an aide memoire or memento. Perhaps there were posters briefing viewers in advance of their seeing the actual display. The viewer perspective varied and model trains appeared when the railway was in the close foreground. If the booklet is any guide, the railway is sometimes seen in the distance, as at Newton for example. Some have suggested that viewers sat in simulated train carriages but this would make little sense for such a view. It is true, however, that the viewer is typically facing towards the north, the Sankey Viaduct being a notable (and possibly ignored) exception. A more useful analogy might have been with a bird flying alongside the track. Some have suggested that the model trains constituted the first model railway although it is equally likely that they were made of cardboard and operated behind the scenes either by hand or by clockwork (as with elaborate town clocks). The apparatus was described as a "Disyntrechon" which provided a "mechanico-graphoramic" view. The fact that there are multiple perspectives suggests that, while there may be sections that are continuous, lights may be dimmed or curtains drawn during transitions. This in turn suggests a proscenium-style presentation with the audience in tiered seats, probably with an optional standing area. The allusion to the Daguerre Diorama suggests that some views were lit such that objects were revealed or hidden sequentially or that variations in lighting in a particular scene marked the passing of time, e.g. while waiting for the early morning train. The reference to "lanes" presumably refers to the roads leading to level crossings as seen at Green Lane (Patricroft) and Ordsall Lane (Salford). The sponsor and author of the Padorama has always been something of a mystery. However, we now see that it was sponsored by one of the foremost companies showing moving (persitrephic) panoramas, Messrs Marshall of Glasgow. Philip Phillips was a well-known panorama artist and the only pupil of Clarkson Stanfield, scenic painter at the Theatre Royal, Drury Lane. Stanfield was one of the most eminent panorama artists of his day although by now he was moving into less arduous landscape painting. It is possible therefore that Phillips inherited the commission from Stanfield. Others have identified the otherwise unknown Thorne as the artist but works on this scale were often carried out by teams. The identity of H. West is not revealed. West was responsible for the sketches in the Padorama booklet and the 1833 "Railway Companion". This person may be another minor scenic artist but it is also possible that it is a nom de plume for Charles Marshall (of Messrs Marshall). In his book "Illusions of Motion", Huhtamo describes Marshall as "elusive". The Marshall brothers were also painters so well able to execute the sketches concerned while also having the authority to decide what would make a good subject for the display and what could be edited out or condensed. 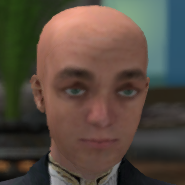 Marshall is thus potentially also the enigmatically named author "A Tourist". The "Railway Companion" may have been a marketing tool to ascertain or excite interest. However, quite why Messrs Marshall are not acknowledged in the 1834 exhibition booklet is a mystery. Perhaps there was concern over how the railway proprietors would regard the panorama and the "revelation" in the Spectator was accidental. Possibly there was concern that the panorama was too "experimental" and a wish to avoid negative publicity should it fail commercially (it appears to have had only one further outing the following year in New York). If the conjectures above are at all accurate, the disyntrechon presentation at the Baker Street Bazaar may have been an interesting hybrid and significantly more sophisticated than the majority of panoramas displayed in this era.